I have two mango trees… a Haden and an Alphonso. The Haden tree’s fruit is about a month later than the Alphonso tree. 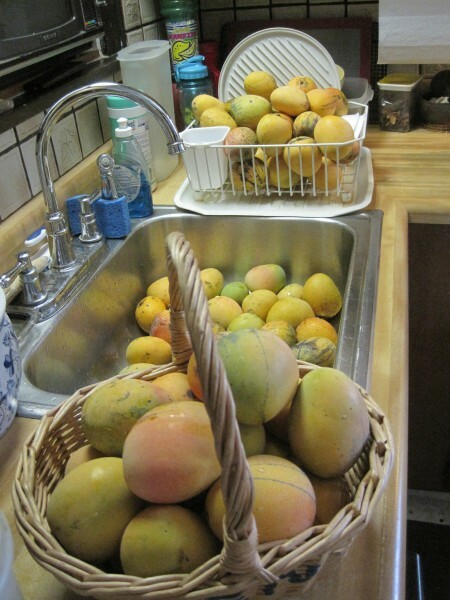 Alphonsos are beautiful to look at, and they smell and taste so-o-o-o good, but………..
My Alphonso mango tree has been dropping an unbelievable number of mangos. It has dropped close to 80 mangos daily for the last two weeks. It’s hard to believe there could be that many mangos on that tree. I can’t possibly use that many mangos everyday, so I have been giving them away by the bagful to any friend or neighbor who will take them. A couple of people are new to Florida and have told me that these are the first fresh mangos they’ve ever had. A friend contacted me to ask how to peel mangos, because all she had was a sticky, juicy mess running down her arm. I had to explain that you do not ‘peel’ a mango. I know, because I had to learn the same thing 40 years ago. The answer to ‘how do I peel them’ is to find the seed and cut it out first. Locating the seed can be done by standing the mango on its end with the stem side up. The seed is about as wide as your open, flat hand and stands up straight in the middle of the fruit. 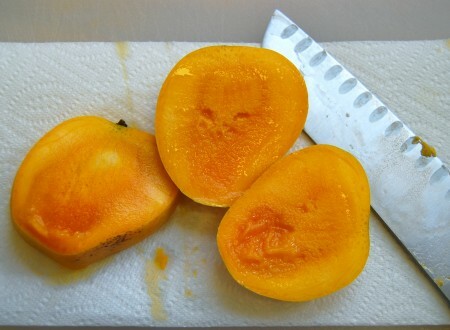 Slice the mango, from the top down, as close to the seed as you can. Once the first side is removed, turn the mango and slice the other side down the seed. When you are finished, you will have two halves of mango that can be spooned out of the shell and eaten, or it can be handled like half a cantaloupe. Slice it and peel the slices. What I have described seems very simple to me, but if you have never seen it done… or don’t handle cantaloupe the same way I do… you still may have no idea what to do. Watch the video, then enjoy your mangos without all the sticky mess. I worked at one time with a bunch of guys from India and I watched them eat mangoes the easy way. They all just cut the small end of the mango off and then squeezed the mango up into their mouths. A sort of squeeze and push, like eating put up ice cream bar. No mess and not fuss… you way does look easier for a salad or more genteel eating. I wonder if these things will grow in the Tampa area? 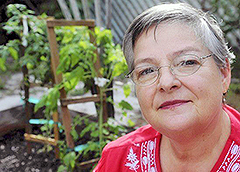 Thanks Lila, I made some mango peach salsa last week and had a heck of a messy time with the mangos. 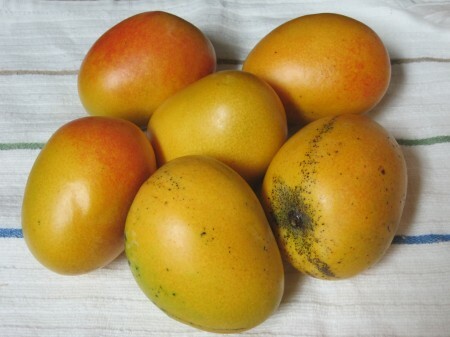 I had eaten mango, but never prepared it.